Ellen Kushner’s moving musical drama about identity, disguise and revelation. Watch a live performance of the show below! Esther: the Feast of Masks is a unique performance piece of story and music, written and narrated by Ellen Kushner, award-winning novelist and host of Public Radio International’s popular program Sound & Spirit. The program brings the Biblical story of Esther to life by juxtaposing it with the stories of four modern characters, all dealing with their own issues of identity, disguise, revelation and personal power. Vashti, the queen of Persia, defies her husband, simply by refusing to come when she is called. Similarly, Rita, a New York wife who left college early to marry, defies her spouse in small ways as she finds her own voice and eventually makes a new life for herself. Esther, the new queen of Persia, struggles with her hidden Jewish identity and what this means for both her and her people. Meanwhile, Ida, a quiet schoolteacher, struggles to come to terms with the space between how she perceives her own racial identity and the assumptions made about her background by those around her. Both women are forced to confront the privileges and burdens borne of their secrecy. As Esther decides whether or not to reveal herself, defy her king and attempt to save her people, Natalie, an American diplomat in Rwanda, witnesses the growing tragedy and is forced to make a difficult choice between personal safety, professional identity and emotional loyalty. And just as Esther uses courage, intelligence and honesty to save her people, Nate, a high school student, finds the strength to confront homophobia, both in himself and in his friends. These eloquent stories of disguise, revelation, truth and courage are skillfully woven together with music from many traditions, all performed live by three talented musicians: Michael McLaughlin (music director, piano, accordion, guitar, vocals), Mary Casey (vocals and guitar) and Joe Kessler (fiddle and vocals). Just as each character in the performance has his or her own distinct voice; each time and place is represented by music equally unique, diverse and powerful. Songs range from African chant and Hebrew folk tunes to ’50s pop and blues. While Esther: the Feast of Masks is rooted in a story traditionally enjoyed around the Purim holiday, the program is appropriate for all seasons. Jews and non-Jews alike react intensely to this program (you can see audience comments on our reviews page), as all of us share the experience of using masks throughout our public and private lives. Masks can be a burden, a joy, or a tool, and putting them aside can often be as powerful. Because of the universality of the themes addressed by Esther: the Feast of Masks and its striking combination of both joy and seriousness, lively discussion on the show’s issues, either between Ellen and the audience or featuring your own local clergy, scholars and activists, generally follows the program. If you’re interested in learning more about Esther: the Feast of Masks you can visit the web pages for Sound & Spirit, where you can listen to the broadcast version of the program. Please note that the live version of Esther: the Feast of Masks is 15 minutes longer than the broadcast version and runs approximately 75 minutes. If you’re interested in having Esther: the Feast of Masks performed in your community, please click here. Esther: the Feast of Masks was originally created thanks to funding from the Jewish Connection Partnership, and its managing partner, the Jewish Outreach Institute. The Jewish festival of Purim is often called “the Feast of Masks,” and putting on plays that tell the story of the Book of Esther has been a Jewish tradition for centuries. Nowadays it’s mostly the kids who put on cute little skits, but in the Old Country such plays were an adult thing, complete with satire and all kinds of transgression. I decided to hook into the old tradition and try to bring the story into our modern day. I’ve tried to create a show for grownups that takes on some of the deeper issues of the Esther stories, like disguises and revelations. Because there are things you can say from behind a mask that you can’t always say as yourself. Not everyone knows the Jewish holiday of Purim, but all of us know what it is to put on a mask. And to take one off. Ellen Kushner (writer, narrator, vocals) is the host of PRI’s remarkable radio seriesSound & Spirit, which Bill Moyers calls “the best program on public radio bar none.” Before developing Sound & Spirit she hosted NightAir and Caravan on WGBH Radio (Boston), and was the writer and host of the Nakamichi International Music Series of classical concert music distributed by Public Radio International (PRI). She is the author of acclaimed works of literary fantasy, including Swordspoint, the multiple award-winning Thomas the Rhymer, The Fall of the Kings (co-written with Delia Sherman) and The Privilege of the Sword. Her short fiction has appeared in The Year’s Best Fantasy and Horror. In addition to Esther, Ellen is the author and narrator of The Golden Dreydl: A Klezmer “Nutcracker,” which she performs with Shirim Klezmer Orchestra (available on CD from Rykodisc) and is now a chapter book for young readers. She is a popular teacher and lecturer at a variety of venues from fantasy & science fiction conventions to church and synagogue pulpits. Michael McLaughlin (music director, piano, accordion, guitar, vocals) is the pianist/accordionist and composer/arranger for the Klezmer bands Shirim and “radical Jewish music” band Naftule’s Dream, and is a co-founder of the international performance art group Terra Nova. He was the musical director for the award winning group which backed Senegalese drummer Ibrahima Camara, and has had the good fortune to play with the world-renowned pioneers of Ska, the Skatalites. He is currently on track for a Doctorate in Musical Arts at New England Conservatory where he studies with Lee Hyla. Josef Kessler (fiddle, vocals) has been a mainstay in the Irish music scene in Boston, toured the United States and Canada for five years with the ethnic rock group Boiled in Lead of Minneapolis, MN, and has been featured in large music festivals including the Montreal Jazz Festival and the Berlin Jewish Music Festival. He and his father, Jack Kessler, a famous Jewish cantor, play together at many events in Philadelphia, New York, and abroad, and are part of the band Atzilut, whose work includes the album “Souls on Fire: Music for the Kabbala” and Concerts for Peace, bringing Jewish and Arab musicians together celebrating the common roots of Arab and Jewish music. Mary Casey (guitar, vocals) is a folk musician and recording artist who has been singing and playing Celtic and folk music for over 20 years, performing in coffee houses, folk festivals, and benefit concerts in North Carolina and across New England. She has recorded extensively with singer-songwriter Carolyn McDade, and most recently performed with Gail Rundlett and Dimitri Eleftherakis at folk venues and festivals in the Boston area. 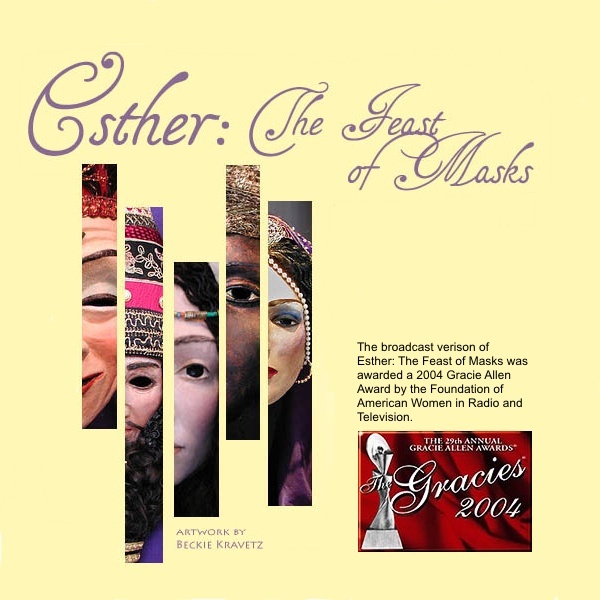 The broadcast version of Esther: the Feast of Masks was awarded a 2004 Gracie Allen Award by the Foundation of American Women in Radio and Television. If you are interested in bringing Esther: the Feast of Masks to your community, please contact Ellen Kushner. More detailed information can be made available during the booking process.